Over at Splitcoast today is the Ways to Use It challenge – to use a paper bag in your design. I chose to use a Pottery Barn bag with the subtle striped pattern. It was used for the snowflake, the background for the reindeer and the sentiment. My layout is the MOJO 207 layout. My card base is large again – 5″ x 6.5″, and was dry embossed. Next comes three simple layers of designer paper over top of some card stock. The reindeer is stamped in the same color as the card base. The sentiment was stamped in the same color and layered over another small strip of the same cardstock. 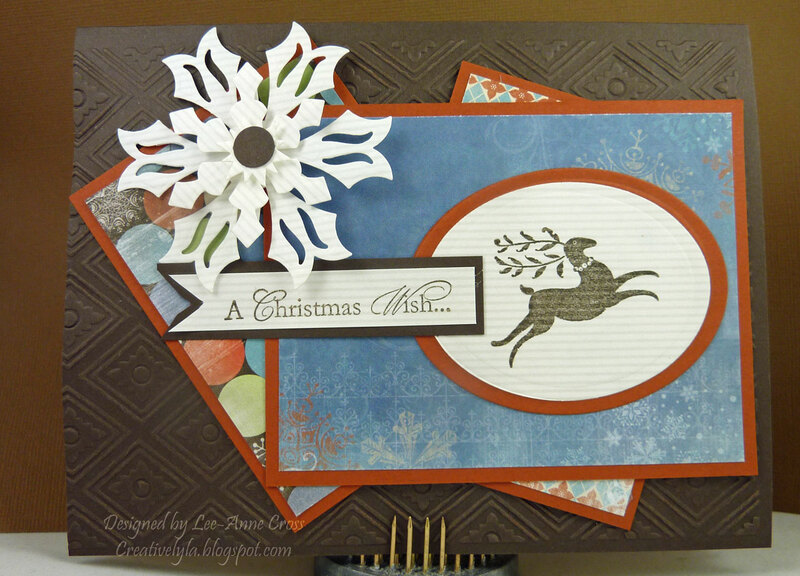 The snowflake is made with the Spellbinders Create A Flake 3 die. I chose three different layers from the set and again used the Pottery Barn bag. A small punched circle was added in the same color as the card base. All layers of the snowflake are popped up on dimensionals to create more interest.